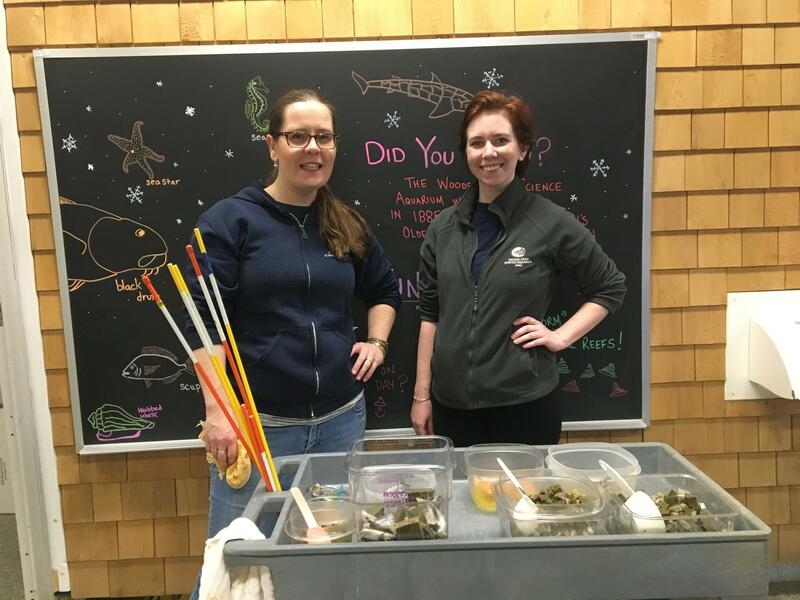 Alison Brodet and Katie Dever, two of the aquarium's biologists who worked during the shutdown to keep the fish alive. For many federal institutions around the Cape, the end of the government shutdown doesn’t mean that things are back to business-as-usual just yet. In Woods Hole, one of the country’s oldest aquariums is coming back to life after a month in dormancy. Terri Frady of the National Oceanic and Atmospheric Administration (NOAA) walked down its darkened corridors lined with tanks of fish. NOAA owns and operates the aquarium. "As you can see, our Christmas decorations are still up, because the shutdown occurred during the holidays," she said. "Santa came to visit us, and we didn’t have a chance to take it all down." Though the government reopened late last week, the aquarium remains closed as staff reclaim the premises and get ready for the public. As with many organizations that were shut down, starting up again isn’t as easy as flipping a switch. "I think everybody is just now trying to figure out where we are and what the priorities are to get back up and running," Frady said. During the shutdown, a team of three contractors still showed up for a few hours each day to maintain tanks and feed the fish. One of those people who’ve gotten used to working in an empty aquarium is Alison Brodet, a contracted aquarium biologist. On Tuesday morning, she rolled out a cart with chopped fish and brown nutrient cubes to feed the fish. "So we’ve got a mix of different types of fish and shrimp. This right here is a gel that’s made in-house," she explained. "We put a bunch of stuff in a blender - a lot of capelin, carrots, and spinach, so that ensures they get all their vitamins." Over the past five weeks, Brodet and her two other co-workers split up the 26-hour-a-week allotment, and they said things were tough, especially because as contractors, they won’t receive any back pay. Katie Dever was hired as an aquarium biologist about a month before the shutdown, and she said it was hard working on reduced hours so soon after getting a new job. "It was a struggle. I had to go back to talk to my parents, and as someone who’s almost 28, that’s something you don’t want to have to do. I’m just hoping that it doesn’t happen again," she said. She also did some graphic design freelance work to keep her afloat, but she’s happy she can get back to doing what she loves, full time again. The aquarium is a microcosm of how organizations like NOAA are scrambling to get back to work. Janice Plante at the New England Fisheries Council, a group that relies heavily on NOAA involvement, said that though the government is no longer closed, she and fishermen still have concerns over upcoming seasons for groundfish and scallops starting on time. "Everything doesn’t get back to normal immediately, because the shutdown lasted for so long. We’ll be faced with some repercussions in terms of timelines and schedules we’re on," Plante said. Overall, they’re glad the government is open again so things like fisheries meetings and reports can start happening. "All of the science center people are just getting back to work, and so we’re realistic that they have a backlog of email and management actions just to catch up and have us get back to place," Plante said. And for the fish at the Woods Hole aquarium, biologist Katie Dever said she thinks they’ll be happy to see visitors again. "You get to realize they have certain behaviors that they’ll do during the day, and a lot of that is watching the people walk by," she said. "A lot of people ask, 'Can the fish see me when I’m looking at them?' And yeah, they can, and they like to watch." She said in particular, the queen triggerfish has seemed more anxious during the empty weeks at the aquarium. The biologists have tried putting dog toys filled with food in her tank to keep her entertained. "They spend their days a lot of the time with the public. When the public isn’t here, they’re kind of like, 'You know, it’s dark and we’re just sittin','" Dever said. The aquarium will reopen to the public on Monday, and NOAA employees and their queen triggerfish will give a sigh of relief. New Bedford fishermen are worried about how catch limits and fishing permits will be affected by the government shutdown, as it enters its 35th day with no end in sight. The shutdown has furloughed many National Oceanographic and Atmospheric Administration (NOAA) employees, the organization that processes permitting and catch limits. As the government shutdown enters its third week, many federal employees living on Cape Cod are starting to feel the squeeze. Some are beginning to look to community resources for help.